Investors are buying bad news as well as good news. 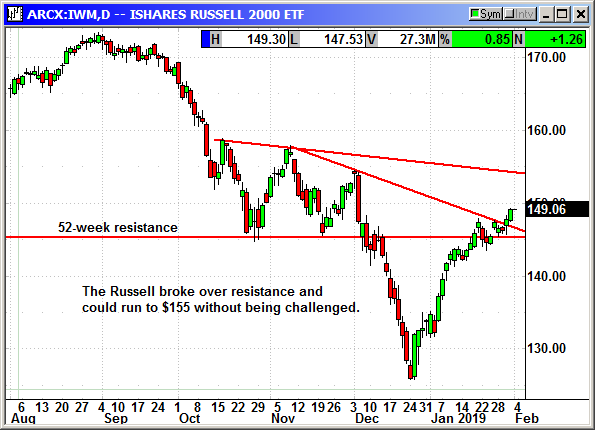 After seven days of choppy trading and two aborted rally attempts the major indexes have broken through that stalemate and appear to be headed higher. 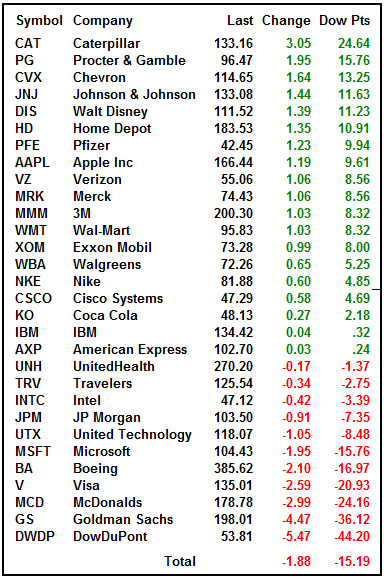 Whether they can continue this rally once the big-name earnings are over is another question. Actually, many of the big-name companies have been struggling. We may be better off when they are no longer driving the market. The challenge as I have written in my commentaries is the earnings forecast for Q1. As of noon on Thursday it had fallen to only 1.1% growth. When that number turns negative the market is likely to follow. I suspect some cautious souls will be leaving early to beat the rush as soon as the major batch of earnings are over. That makes the week starting on February 11th a potential turning point. Everyone knows that calling out a specific date means exactly the opposite will happen but that is the most likely week for a turning point. Back on October first the consensus target for the S&P from 46 analysts was 3,035 for year end 2019. As of Monday, that has fallen to 2,750. The S&P closed at 2,704 on Thursday. That does not leave a lot of room if they are correct. However, most believe we will see higher numbers and then decline back to 2,750 in the fall. They believe the declining earnings growth, weak global economy, potential for a hard Brexit, Fed policy change and simple market fatigue will be the causes. 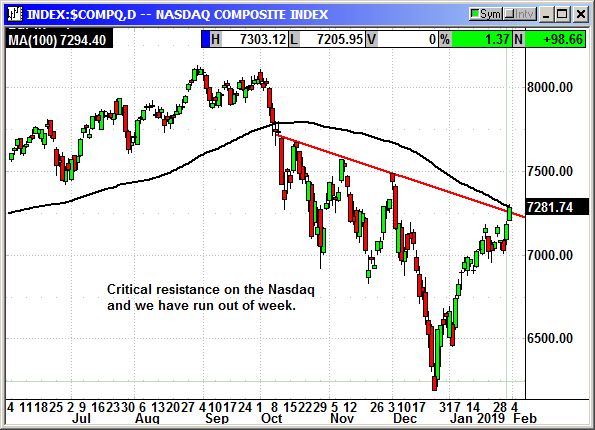 The challenge for Friday is the critical resistance on the Nasdaq. The tech stocks have led the rally over the last two days and they have reached a point where they have run out of headlines and out of week. 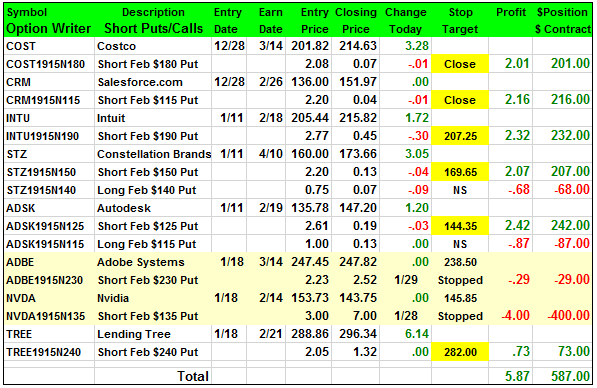 Weekend event risk means all their uncaptured profits are at risk and resistance is going to attract the shorts. Conversely, if the Nasdaq can shake off the more than $80 drop in Amazon after the close and buy that bad news, we could be testing 7,500 early next week. 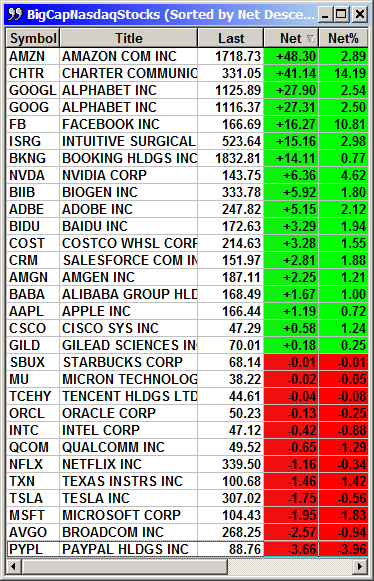 The FANG stocks are coming back to life but prior reporters are falling into post earnings depression. Nearly everyone on the bottom of the losers list has already reported. 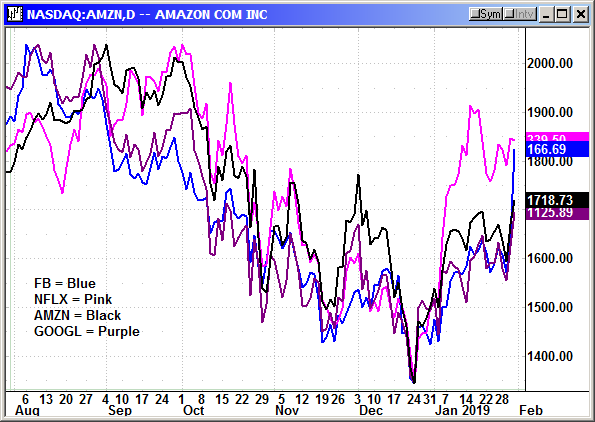 The FANG stocks are back in correlation with FB, AMZN, GOOGL rising as one in regular trading. 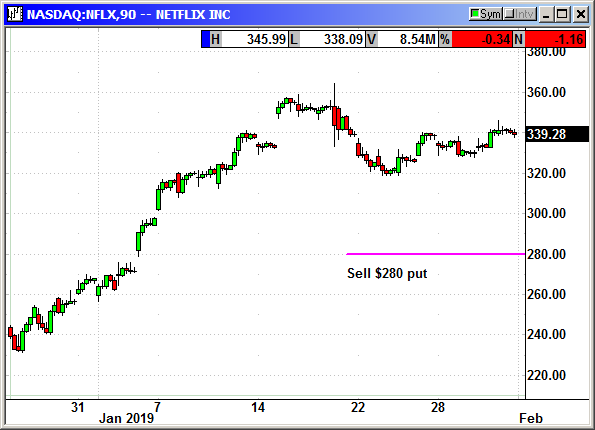 Amazon fell -82 in afterhours so this chart will look different on Friday. The tariff sensitive Dow stocks have been supporting the index with the China delegation in Washington for talks the last two days. 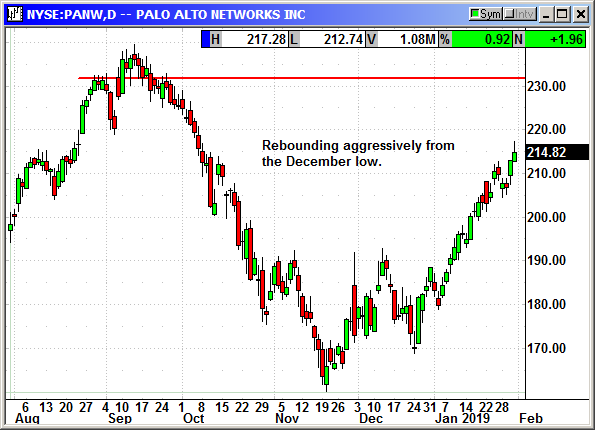 Many of the Dow components have reported and the index could be facing some early post earnings depression next week. I would recommend caution about adding new positions. If you have current longs I would let them ride but keep your stops tight. We could be in for a rocky summer if earnings growth continues to decline. I apologize for not putting out a letter last week. Just after we emailed the Option Investor newsletter, our database server crashed. I could not post content or send emails for 24 hours and we are still limping along and it has been a week. You really appreciate backups when disaster strikes. You also become painfully aware of what was not backed up. 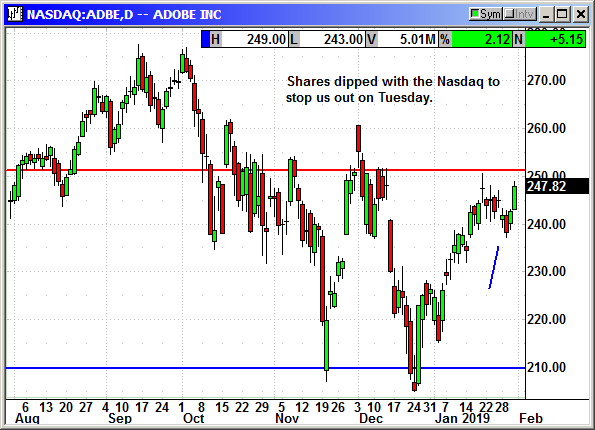 No specific news on Adobe but the stock dropped with the Nasdaq on Tuesday to stop us out at $238.50. We were killed on this position. 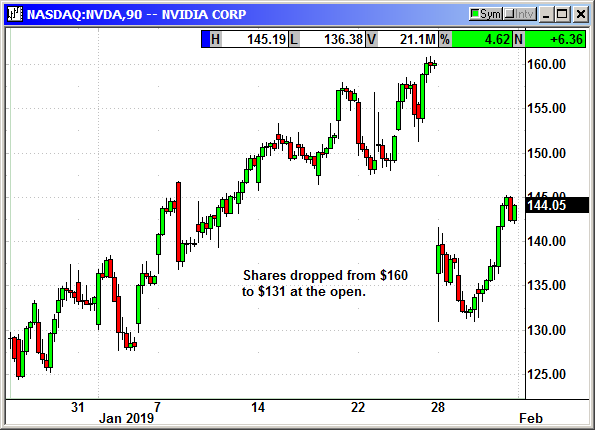 Nividia announced an earnings warning before the open on Monday and fell $29 in the opening print. This was a massacre. The gap lower caused the stock to open below our stop loss and we were stopped at the open.